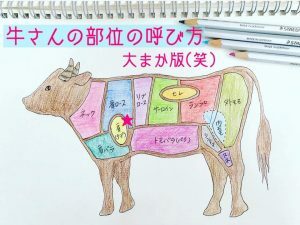 This is the “Daisen Black Cattle” that received a gold award as a section of beef cattle rated highly for the quality of their meat at the “National Wagyu Ability Expo”, which is known as the Wagyu Olympics. The contrast of red and white, with beautiful white marbling. These are the extremely valuable Daisen Black Cattle. There are some local people who have still not tasted the meat of this precious black cattle. On this occasion, we visited the barns of Mr and Mrs Nishida who manage a “Yakiniku” restaurant that uses the meat of black cattle. 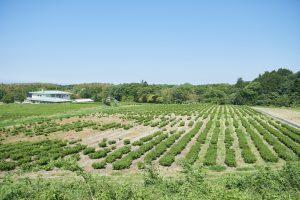 The Nishida farm is surrounded in green, and is in a quiet place where cars rarely pass. 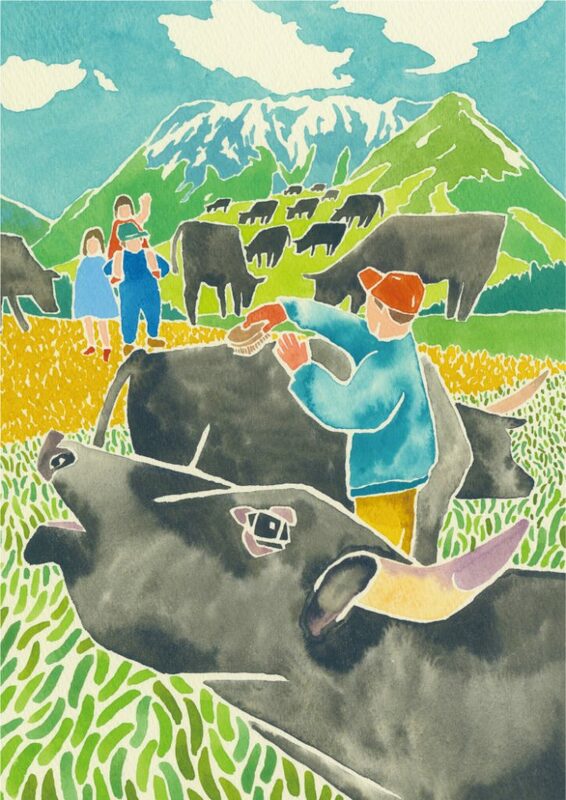 The Daisen Black Cattle Natural Farm is in the foothills of Daisen, at an altitude of 10 meters. It is surrounded by large areas of natural beauty, is cool in the summer, and blessed with delicious water. 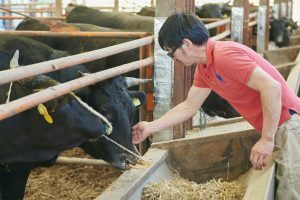 “Cows are sensitive, highly refined creatures, so we are raising them with a sense of freedom and no stress in a clean barn.”, says Yoshiki Nishida, representative of Daisen Black Cattle. Nishida has loved cows since his childhood, and often played in the barn at his house. “All of our cows have names. That is “Sato-san”…and that…”, he tells us. Nishida names each and every one of his cattle, and among them are black cattle with unique names such as “Hakuho”. The Nishida farm was the first place I had seen black cattle. They had beautiful, shiny, jet black coats and clear pupils. I was taken aback by the beauty of the black cattle. “They are so cute…and beautiful”, Nishida sighs. It is clear from my conversation with Nishida that he just loves everything about the cows. 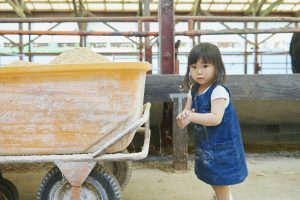 It has been several years since Nanako married into the Nishida farm, and she helps Nishida’s job while raising their two-year-old daughter. Nanako originally worked for a construction company, and apparently had absolutely no idea what the job of raising cattle involved. “I am not really sure how much help I am being, but raising cattle is still an unknown world for me. 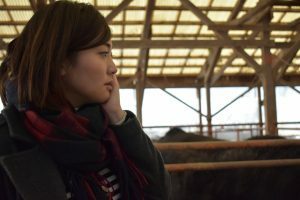 For that reason, I want to get to know the cows on the same level as consumers and ordinary people, and I realize that there are things that I can explain in an easy-to-understand way, and things that I can communicate.” Nanako does not only look after the cows, and is also involved in a wide range of daily activities, communicating information about the cattle-rearing life and the black cattle themselves on SNS etc., so that more people will get to know about the “Daisen Black Cattle”. Nanako is a skillful artist and the information she communicates with her cute illustrations is very popular. “We eat cows for meat. Before that, people need to raise the cattle. Then there are people who need to process them. I had not thought about it very deeply before getting married”, says Nanako, introducing us to a book. “Before eating yakiniku”. 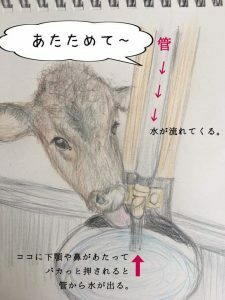 Looking at Nishida, embracing life in a sincere way and raising the cows with deep affection, I would often have cause to think about what it is to receive a life and raise cows. Their daughter Eiko-chan is also very helpful. “I sometimes think that it is a lot of hard work to raise cattle without a break while bringing up a child. However, my daughter also helps me with the cows and it is such fun to work together as a family. There are times, though, when I would just like to go out as a family without looking after the cows”, laughs Nanako. When I say that she “married into a family with lots of children”, she shyly answers “Yes. That is for sure!”, and her gentle expression is that of a loving mother of the cows. These are black cattle brought up in a loving way. These are black cattle that are not only blessed with the beauty of Daisen, but are also filled with the love of the Nishida family. Be sure to taste this meat enriched with deep affection!